When it comes to ski touring, the snow quality and ski terrain are just as important as the length and gradient of the run. Therefore it is a shame that the vast mountain ranges in inland Norway often gets overlooked in favour of the fjords. If you venture inland, you will find the most reliable snow conditions. The colder climate means a longer ski season and an increased chance of fresh powder snow from top to bottom. The inland terrain is varied and often has pine trees in lower section of the runs, which provides a tough challenge for seasoned skiers. A notable case in point is the Tamok valley, situated within driving distance of the coastal town of Lyngen. The territory is dominated by large rounded peaks, long couloirs and big open faces. 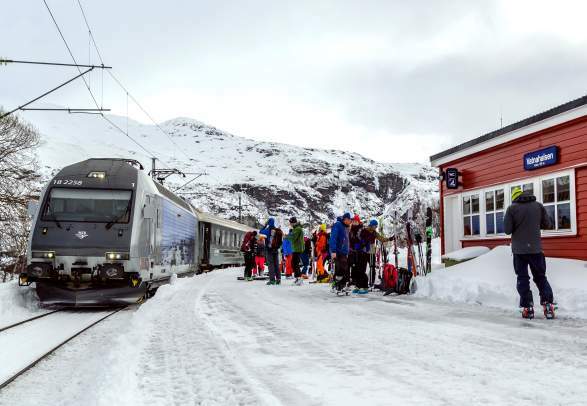 Another location worth checking out is Jotunheimen, which covers a vast area with sky-scraper peaks and plenty of skiing experiences above the tree line. An advantage when you plan a trip to the inland mountains is the extensive network of skiing lodges and mountain huts. Choose a base in one location with quick access to the surrounding slopes, or move from hut to hut – this is a great way to enjoy the region’s potential to the full. Inland ski touring in Norway. Before embarking on a ski adventure, it’s crucial to familiarise yourself with the surroundings and prepare for some testing conditions.